Arthur Miller was one of the titans of American dramatic literature of the 20th century, and he had a long and interesting life. He married three women, one of whom was Marilyn Monroe. He was targeted as a communist in the McCarthy hearings and one of the only people to defend Elia Kazan for his decision to name names. He had a son he never spoke about. He had plenty of plays that didn’t turn out to be enduring works of infinite genius, but he had a magical combination of deep feeling and immense articulatory power that gave us The Death of a Salesman and The Crucible, among many other remarkable plays. He died in 2005, three years after the death of Inge Morath, a photographer and his wife of almost 40 years. In one piece of televised interview footage Miller is asked if he’s ever thought about what he’d like his own obituary to say. Arthur Miller: Writer is a rather unique documentary, primarily because it’s directed by Rebecca Miller, his daughter. She says, in one of her occasional voiceovers, that she had come to realize the man she knew was very different than the one the public knew, and captured hours of footage of him in his later years, reflecting on his personal life, the craft of writing plays, politics, fatherhood and how he felt about his own legacy, often while he puttered in his garden in Connecticut or tinkered with carpentry projects. Much of the film is composed of Miller’s own words and read in his own voice from his autobiography. He was an intense writer with a strong voice (both authorial and physical), and those passages are well-chosen and wonderful to listen to. The filmmaker combines them with archival footage ranging from public interviews to home movies to still photographs to snippets and stills from productions of his plays, all of which come together in a warm, intimate way. Engaged and engaging, this documentary is a must for theater people and for writers, and will be a treat for anyone who has somehow managed not to be familiar with the playwright or his works. It’s loving but remarkably dispassionate; Rebecca Miller is a filmmaker first and a daughter second in this project, and there are questions that don’t have answers or don’t have especially good answers (his and Inge’s decision to institutionalize a son born with Down Syndrome, while it was a relatively common practice at the time, was clearly an open wound in the family and Miller doesn’t shy away from the difficulty of addressing it). 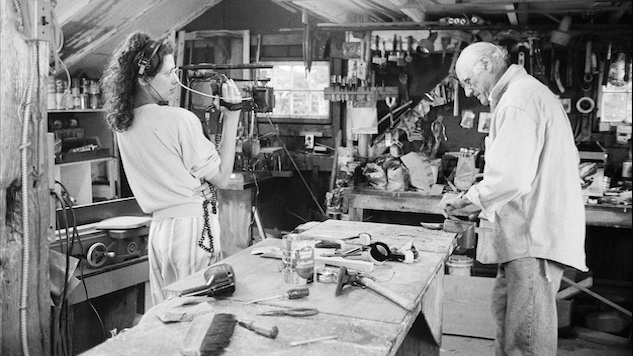 Arthur Miller is clearly very much aware that his daughter is filming him for posterity, but there’s no sense that he’s providing a curated persona for the camera—there’s a strong sense of introspection and honesty here. The film is beautifully edited, conveys its subject as a person of both great intellectual power and depth of emotion, and flits back and forth between the public and private faces of Arthur Miller with a deft, thoughtful compositional sensibility. Arthur Miller: Writer premieres tonight at 8 p.m. on HBO.